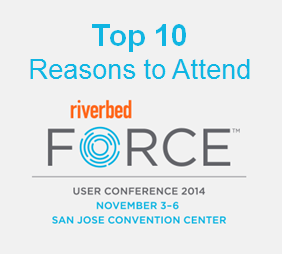 Riverbed FORCE, Riverbed’s user conference is coming up quickly. There are so many reasons to attend, but here we picked what we thought were the Top Ten reasons to join us. Are you ready to test yourself? Now is your chance to become a Riverbed-Certified Solutions Associate (RCSA) and a Riverbed-Certified Solutions Professional (RCSP) at our on-site certification center during FORCE (up to $1,875 in value), all included as part of your registration! 9) Fun! I mean, professional networking. Join us for networking activities and exciting evening events, including an electrifying party at Levi’s Stadium—the new home of the San Francisco 49ers. These networking activities are fun and informal, giving you time to interact with peers, technical experts, technology partners, and Riverbed leaders. Meet the partners at the center of the Riverbed Application Performance Platform ecosystem in person. You’ll find more than 20 leading technology partners with technology and location-independent computing solutions for hybrid enterprises. We’ll get you in shape to take on the IT challenge you may face. Riverbed FORCE offers more than 60 scheduled technical sessions for in-depth training with hybrid architectures and solutions in performance management, WAN optimization, branch converged infrastructure, application delivery, and cloud storage. Get hands-on experience deploying and managing solutions for application delivery, WAN optimization, network performance management, application performance management (APM), network planning and configuration management, end-user experience, modeling and simulation, branch converged infrastructure, programmability, and cloud storage. Riverbed CEO Jerry Kennelly and Chief Scientist Hansang Bae, Crossing the Chasm author Geoffrey Moore, Intel CIO Kim Stevenson, and others will be taking General Session stage at Riverbed FORCE. This all-star lineup will kick things off by sharing their experiences and best practices for evolving the hybrid enterprise. These sessions offer insight from the highest authority—our customers. Caterpillar, Shell, Intel, Blue Cross Blue Shield, Epsilon, International Justice Mission, and other global organizations share how they are evolving to a hybrid enterprise and using application performance and data protection to their competitive advantage. With access to thousands of businesses, analysts have their fingers on the pulse of what’s really going on. Validate your ideas and decisions when you hear where the hybrid enterprise is going from leading industry analysts Joe Skorupa from Gartner, and John Rakowski and Andre Kindness from Forrester. Hear about exciting new Riverbed products and solutions as they are unveiled at FORCE, including new integrations between Riverbed products. In addition, Gerald Combs, creator of Wireshark, will show off the new user interface in the upcoming 2.0 release of Wireshark. Riverbed FORCE offers more training, more certifications, more industry thought leaders, and more social and networking activities than any comparable industry conference. FORCE is the one event that gives Riverbed customers the tools and knowledge to make today’s hybrid enterprise perform at its peak. What are you most looking forward to at Riverbed FORCE? We’ll be sharing more indepth guides based on the IT challenge you may be facing, so keep an eye out and if you haven’t already, register for FORCE today. We can’t wait to have you.